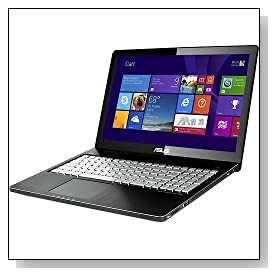 Dark grey in brushed hairline aluminium 15.6 inch ASUS Q550LF-BSI7T21 with high end specs of 4th generation Intel i7, 8GB memory, 1TB hard drive, Full HD touchscreen, Nvidia GT745M dedicated graphics card and LED backlit keyboard is a certified and refurbished product with very little or no sign of use and 90 days of warranty and it includes all the accessories of the original model and you probably won’t even notice it is refurbished at all. It is suitable for multimedia editing, gaming and heavy multitasking and can be used for work or entertainment purposes. ASUS Q550LF is offered with the dual core ultra low voltage Haswell Intel i7-4500U mobile processor (4MB L3 Cache) at 1.8GHz base speed up to 3.0GHz when extra performance is needed for more demanding applications with turbo boost and hyper threading so you have two cores and four threads in parallel for maximum efficiency, 8GB DDR3 SDRAM memory for superior multitasking and running complex programs smoothly and can be expanded up to 16GB, 1TB hard drive at standard 5400rpm spindle speed for all the storage space anyone would need and Windows 8.1 operating system pre-installed which is good to use with a touchscreen. The i7 CPU although not the most powerful i7 as it is designed with power efficiency in mind (able to run at low speeds during simple daily tasks so you get more battery life out of it), is still capable of handling all your daily tasks as well as the complex multimedia and gaming- Passmark benchmark score is 3843 as of this review day. 15.6 inch Full HD IPS LED backlit touchscreen with 1920x1080 pixel resolution and larger viewing angles up to 178 degrees offers rather impressive sharpness and clarity of images and vibrant colours and Nvidia GT745M GPU with 2GB dedicated memory helps render superior images for games and videos and shall let you play many of the latest 3D game titles even at medium to high settings and resolutions at 25 to 60 frames per second but this is not a top of the range gaming card if you’re an advanced gamer, and remember to use the computer plugged in rather than on battery if you want better gaming performance. Intel Wireless Display- WiDi feature means you can transmit multimedia or any content from the internet or HDD directly onto your large screen HDTV without needing any cables. SonicMaster Audio and integrated Bang Olufsen stereo speakers with external subwoofer gives you clear, loud and detailed sound with deep bass when you’re listening to music or streaming videos. It has a good quality 1.0MP webcam with an integrated microphone to chat live with friends and family or for teleconferencing on Skype or any other apps. 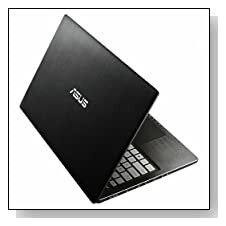 Elegant black Asus Q550LF with brushed hairline aluminium finish weighs 6 pounds with dimensions of 15.10 x 10 x 1.10 inches so it is portable enough without sacrificing on screen size and quality or computer functionality. Silver island-style keyboard with chiclet keys is LED backlit for typing comfortably in darker rooms but apparently shines a little underneath the keys and has a 10-key numeric pad for easy number crunching and a decent responsive wide-type seamless touchpad with 2-finger multi-touch. It has a DVD/CD burner as well as a good range of connectivity options including a Mini DisplayPort, 10/100/1000 Mbps Gigabit Ethernet with RJ-45 connectivity, 802.11ac wireless with 3 times speed and wider coverage, Bluetooth 4.0 to sync with compatible Bluetooth enabled devices wirelessly, an Audio Jack: Microphone-in/headphone-out combo jack, 3 x USB 3.0 ports for quicker data transfers (and are backwards compatible with USB 2.0 devices), an HDMI 1.4 port, a Media Card Reader that supports SD, SDHC, SDXC and MMC formats, Dragon voice recognition to control apps conveniently with voice commands and a 2.5mm External Sub-woofer connector with >5W output. Conclusion: Sleek and modern, elegant and durable ASUS Q550LF-BSI7T21 is a high end computer offered at a very decent price, because of being certified and refurbished but don’t worry as you won’t notice any difference with the original model that costs so much more and you really are getting good value for money here: A Haswell i7 processor, large amounts of storage and memory, Full HD screen with IPS panel and NVIDIA GT745M dedicated graphics with 2GB memory, a 60-day trial version of Microsoft Office Home and Student 2007 that make it good for home entertainment, multimedia editing, gaming, school and business use. Battery life is OK as it can last up to 4-5 hours depending on what you do on it (or a couple of hours for heavy gaming). Despite not having a Solid State Drive but a slower 5400rpm mechanical hard drive the system turns on in up to 7-8 seconds, works very quietly, offers very decent sound with Bang and Olufsen ICEpower and the picture quality is really good. With 6 lbs of weight it is a little heavier than an average 15.6 inch laptop but with so many things packed into this unit, you’d have to do with a bit of extra weight. So the specs may appear to be a bit much for simple daily tasks like just web browsing or checking emails but you’re obviously getting all this at a rather affordable price and at least you will be performing those simple tasks faster than normal and you’ll be running several things at the same time without experiencing any delays.